Did January seem long to anyone else? I'm over the cold weather, especially the nasty rainy weekends where my kids can't go outside. Prior to kids I would have loved a cold rainy weekend inside, but after kids it's like slow torture. Hoping it warms up soon in Texas. I'll take triple digit heat any day. 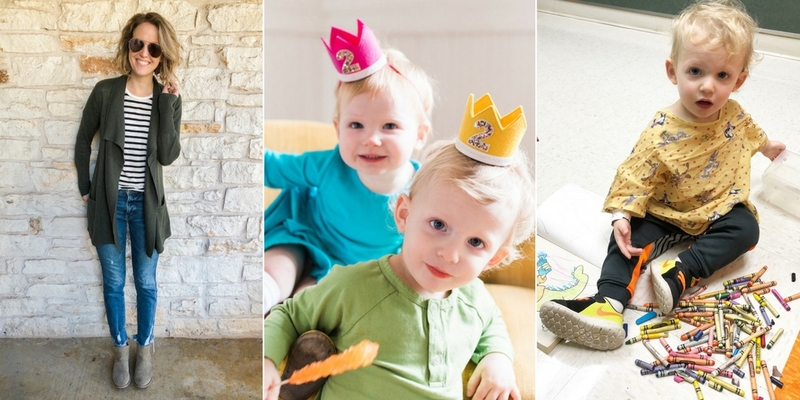 While most weekends in January we were cooped up inside, we did celebrate Walt and Whitney's 2nd Birthday! They are adorable and exhausting at the same time. Walt also had surgery for his second round of tubes and adenoid removal. He was fussy and ran a fever for almost a week after surgery. It was a rough recovery, and no one slept. Two days ago we took away Whitney's pacifier for good, and the past two nights she's screamed (not cried) for about 30-45 minutes before she passed out. Thankfully she naps at school without one, so we're hoping it's not too hard of a transition. I tried my best to complete all 5 January goals, but managed to accomplish 4. February is going to be a fun month, mainly because I can shop again ; ). I DID IT! I did a lot of sporadic shopping in December so for January I set out to not purchase any clothing for myself (including shoes)! I also did a good job of not buying a lot of kids' clothes which I tend to do. I was inspired during the month to participate in the Winter 10x10 Challenge and enjoyed learning how to mixing and match only 10 items in my closet for 10 days. See my 10 outfits here! I also wasn't tempted to shop because I'm over purchasing winter clothes and want to wait for spring clothing to arrive. On my list are overalls, black Birkenstocks and dark wash distressed boyfriend jeans. I also want to buy a few business casual outfits for work since I'll be traveling more for business and presenting often. Loft is usually my go-to for dress wear. Written and posted! I absolutely loved my time in beautiful Charleston. Check out my three day guide for the best restaurants, activities and where to stay! My goal for January was to edit one video, and I ended up completing two. Christmas 2017 and How I Make Money Blogging! I'm using iMovie, which is very simple. The hardest part is finding the perfect song for each video. I'm curious, do you watch YouTube? I rarely watch it unless I'm having some sort of computer issue and need a visual tutorial. Alex watches it EVERY night before bed. YouTube is his new TV. I did quite a bit of decluttering, which included a few sales on Poshmark and donating a LOT of toys. Having all of my floors pulled up for our brand new flooring forced me to clean out every single closet, and only put back the items I really want/need. I didn't get around to vacuum sealing my vintage dresses, but I hope to do that soon. Maybe when I get the itch for spring cleaning ; ). I can't fully scratch this one off my list, but I did start a 2017 family yearbook project on Shutterfly. I even uploaded the photos. Now I need to start building out each page...ahh so many photos! I also didn't get around to printing any photos, but it's on my list for February. I moved in to a new office, and my desk photos are from 2016 when Walt and Whitney were tiny. When I move in to a new space for work I tend to leave it as is and years go by and it still looks exactly the same. With my new role I have a wonderful office with three huge windows and lots of room. I want to add some fun elements to make it feel inviting and cozy (as cozy as an office in a corporate building can be). Due to cold weather, sick babies, and my job I've really been slacking on working out. I have a Pure Barre Round Rock membership and want to take full advantage of it this month. Twice a week is what I'm shooting for. Nights have been pretty crazy, so I think the best time for me to go is the 5:45am class which they offer on Monday, Wednesday and Friday. With my new role, life has been VERY busy. I've taken on a lot more responsibility which is great, but with that comes added stress and things on my to-do list. By the time I get home I'm exhausted, then you add kids and the bedtime routine. In the past I might stay up till 11 or later working on my blog, and then waking up at 6:15 am to start my day. Right now, I don't think my mind and body can take it. Some nights are different, and I want to stay up to work on a fun project, but it's a case by case basis. Some nights I go to bed and my house is a complete disaster or my kitchen is a MESS, but I don't have the energy to clean it. Last week I wasn't able to get groceries for almost the entire week so we ate out a ton. It's hard not to feel guilty, but I want to give myself a break and realize right now is a very busy time in my life. Life will never be perfectly balanced, but I try my best. Some days I might fit a work out in, but I don't have time to blog or clean. Or some days my kitchen is finally clean, but it's because we ate out and our fridge is pretty much empty. I'm writing this at 5am in the morning because I couldn't keep my eyes open last night, and I don't have any time during my day to write. We'll see how this goes ; ). Last year my monthly goals often included meeting someone for lunch/coffee who inspires me. I absolutely loved setting aside time to meet some and learn about their craft. Since I stopped planning blogger events I've missed socializing and meeting new bloggers. I would love to grab dinner or coffee with someone in Austin I've never met. Whether they're a blogger, inspiring mom, or a woman in business I know I will learn something new, and extending my network is always a plus. I'm also excited to be attending the Thrive Blogger Conference towards the end of February, and I know I'll be meeting a TON of amazing women. P.S. if you're interested in attending, use code "jesseatx" for $50 off your ticket! I'm putting this one on my list again, because it's daunting and this monthly goals post keeps me accountable. It really does! I know many people who categorize and add their photos to Shutterfly throughout the year so when it comes time to create their family yearbook it's pretty much done. I should probably do that, but let's be honest, it's not going to happen. I'm much more of the last minute dump hundreds of photos in and try to sort type of gal. Last year my book was around 36 pages (less than $80), so we'll see how big it will be this year. The hard part is trying to find the time to do it. February is going to be a very busy month, but I think it's going to be great! While some might set yearly goals or resolutions, I'm sticking to monthly goals because in my eyes they make goal setting fun and keep them more attainable. Setting monthly goals gives my mind something to focus on, and little by little I can see positive changes happening because of them. 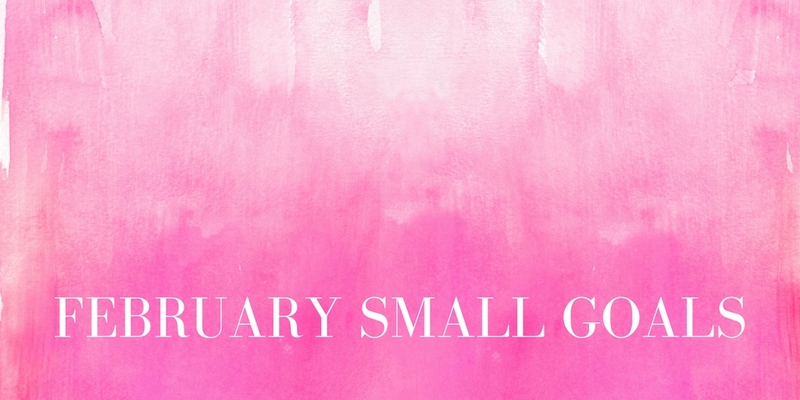 What are you up to in February? !